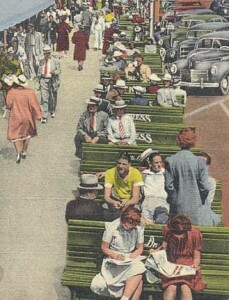 “In the early 1900’s St. Petersburg was known as the “City of Green Benches”. At their height some 2,500 benches lined the downtown sidewalks inviting passers-by to slow their pace and make friends of strangers. These benches were a gathering place for residents and tourists alike, and served as a symbol of our hospitality, bringing people together each day. As we searched for a name that would be original to the brewing world and representative of St. Petersburg, we needed to look no further than the image of the green bench.